Abacus Mountain Guides began life in 2000 in Fort William. With over twenty five years of experience, IFMGA Mountain Guide Mike Pescod and Abacus Mountain Guides provide world class mountain adventures on the west coast of Scotland. World class adventures require world class instructors, so we only use the very best. All our hill walking, mountaineering, climbing and mountain biking instructors are fully qualified with UK or international qualifications, enthusiastic, knowledgeable and very keen to share their enthusiasm with others! ​Our summer months are kept busy guiding various routes on Ben Nevis, such as the Mountain Track, CMD Arete and Tower Ridge, along with classic scrambles of the area like the Ring of Steall, and Curved Ridge and the Aonach Eagach in Glen Coe. We also travel further afield to guide on Skye's Cuillin Ridge, and our increasingly popular Sea Stack Odyssey. Winter brings us back full time to Fort William and we are non stop with Winter Ascents of Ben Nevis, Winter Skills Courses and guiding and instruction for Winter Climbing and Mountaineering. Brand new for winter 2019 is our Scottish Steep Skiing course. Our priority is to create the perfect trip for you, and this is what gives us the most satisfaction. Most of our work is private guiding so let us know your goals and aspirations and we will do our best to make it happen. We specialise in providing exactly what you want. If you can't find it here please get in touch and ask. ​We have a variety of group courses throughout the year, ranging from Ben Nevis group walks, to pushing your grade on our Performance Winter Climbing Workshop, and everything in between. We also provide Summer Mountain Leader and Level 2 Mountain Bike Leadership Award courses. From the start of May until the end of September we run Ben Nevis Group Walks up the Mountain Track. Join a group to reach the summit of the UK's highest peak. 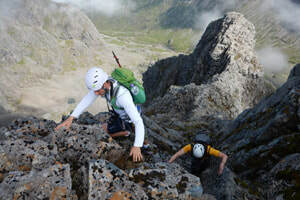 Take on the challenge of CMD Arete or Tower Ridge on Ben Nevis, or the classic Aonach Eagach or Curved Ridge in Glen Coe with the added security of a guide.